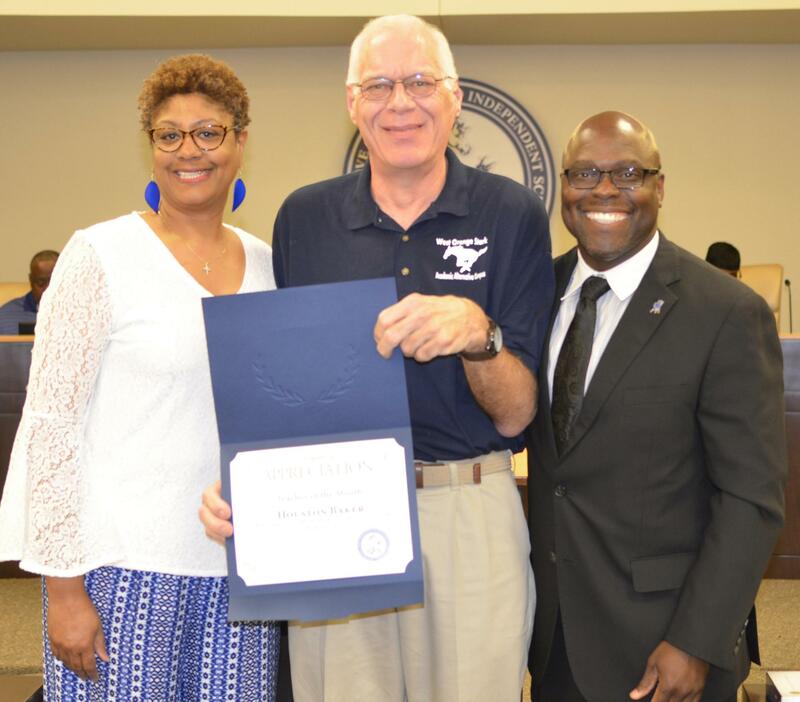 Each month, West Orange - Cove CISD is pleased to recognize an Employee of the Month. Employees are selected by their respective campus and presented with a Certificate of Achievement in front of the WOCCISD Board of Trustees. Recognitions are made by the individual campus principal and Superintendent Rickie Harris. 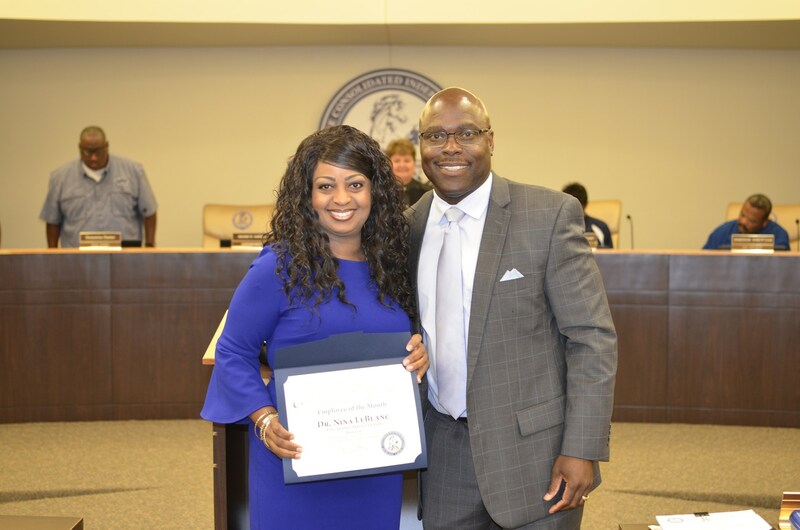 July 2018: West Orange-Cove CISD Child Nutrition Director Danielle Robinson was recognized as the July Employee of the Month for her dedication to the students of the district and the community. During the summer, Robinson and staff not only provided meals to students at Summer Feeding Programs within the district but also served meals to community Vacation Bible School programs. Robinson's willingness to go the extra mile for Mustangs and Stallions is so appreciated. She and her staff have also worked afterschool concession stands and more. We appreciate you, Danielle! 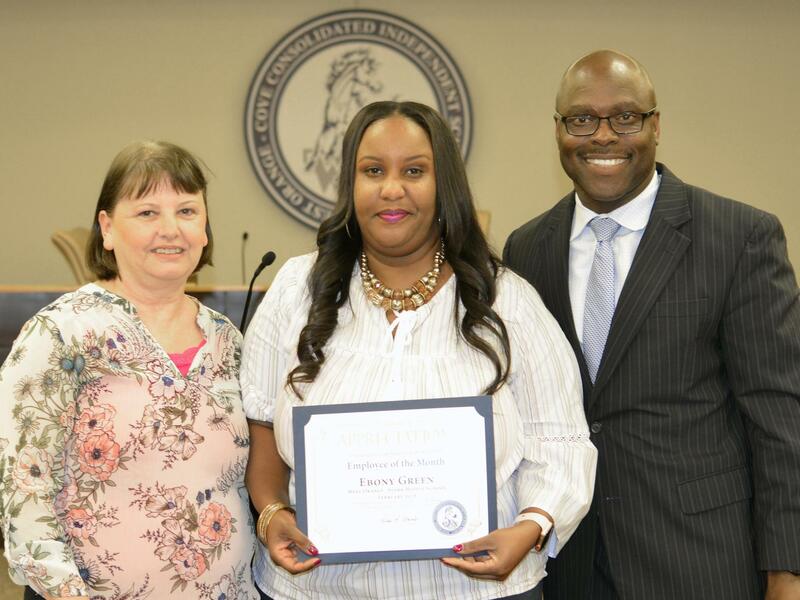 June 2018: WOCCISD Bus Aide Orelia Wallace was recognized last night as a Mustang Hero in front of the Board of Trustees for her outstanding service on May 25, 2018 when she used CPR to save the life of child. 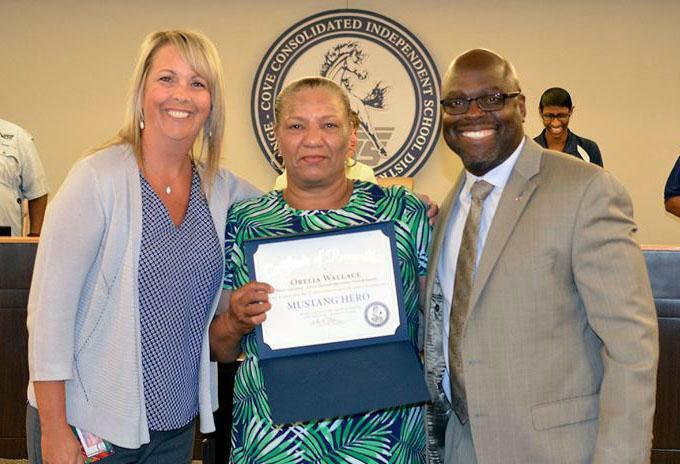 Executive Director of Student Services Heather Knox presented the recognition and said, "Tonight we would like to publicly recognize Ms. Orelia Wallace for her true act of heroism. On Friday, May 25, during the morning route for North Early Learning Center, Ms. Wallace was on the bus and noticed a child and mother in a front yard." The mother was visibly upset and her child was actually going in and out of consciousness. Ms. Wallace immediately exited the bus and started giving CPR while the bus driver called for assistance. Ms. Wallace continued to administer CPR until an ambulance arrived. We are so proud of Ms. Wallace. She is a Mustang Hero and an amazing member of the WOCCISD Transportation Team! She is pictured with Mrs. Knox and WOCCISD Superintendent Dr. Rickie Harris. May 2018: Ambrose Baker is a devoted team member of the AAC. He does what ever needs to be done to keep it organized, on task, and running smoothly. He is the middle school math teacher as the AAC, he assists the special education population on campus and in the community as the homebound teacher. He also assists the high school in the lovely duty in the cafeteria. We can depend on Mr. Baker to open our doors to get our day started at the AAC. April 2018: Thereze Sichko is the Athletics Department Secretary and organizes all things associated with the athletics program. From ticket sales to travel associated with our teams, Thereze handles paperwork, supplies, logistics, and more. She is an integral component to the success of our students and coaches. Congratulations Thereze! We are so appreciative of ALL you do for us! March 2018: Congratulations to WOS Elementary Attendance Clerk Latricia Morris. She was recognized by the Greater Orange Chamber of Commerce as one of two WOCCISD Employees of the Month of March. Mrs. Morris goes above and beyond to support WOS Elementary attendance goals on a daily basis. She contacts parents and teachers to gather feedback in order to assist students with attending school. She supports all campus goals and initiatives to enhance student achievement. She is a true asset to our campus. We appreciate you Mrs. Morris! 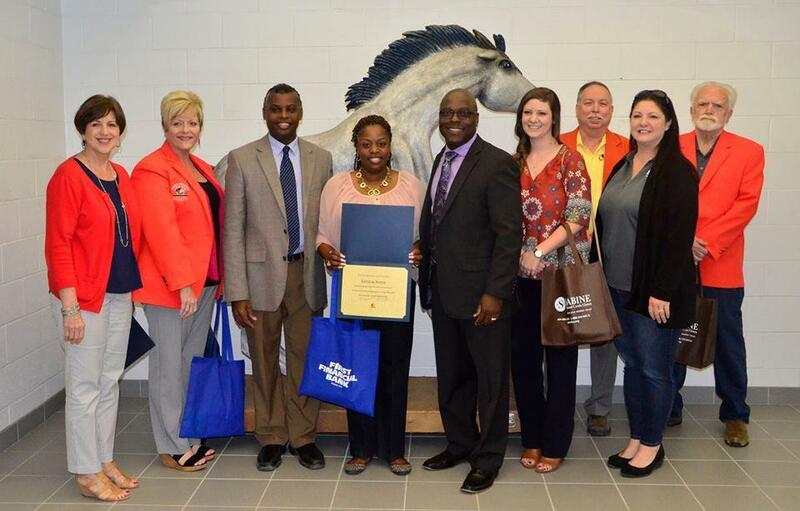 February 2018: West Orange - Stark Middle School Nurse Ebony Green is the most recent WOCCISD Employee of the Month. Congratulations! Nurse Green has a sweet disposition and is very dedicated to our students' overall health and well-being. She is a valuable asset to our team! Her recognition was presented in front of the Board of Trustees. 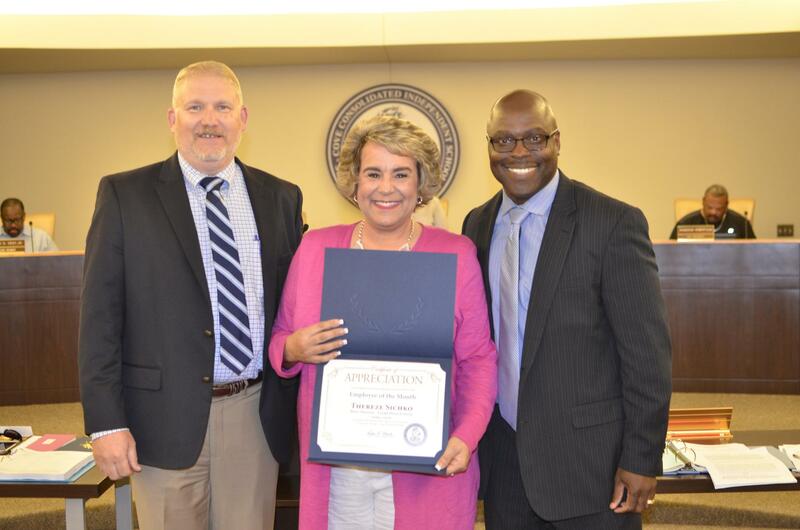 She is pictured with Principal Sherry Harris and Superintendent Rickie Harris. 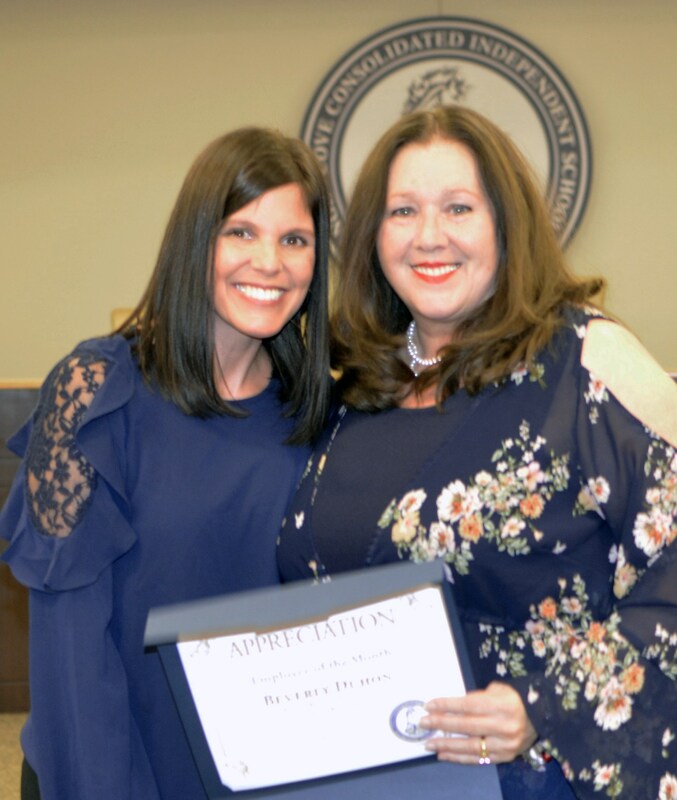 January 2018: North Early Learning Center secretary Beverly Duhon was recognized as the District's Employee of the Month. She is dependable, helpful, kind, and patient. She is the Heartbeat of the school. Additionally, she is wonderful at keeping everyone on track! She is pictured with Vickie Price, principal. 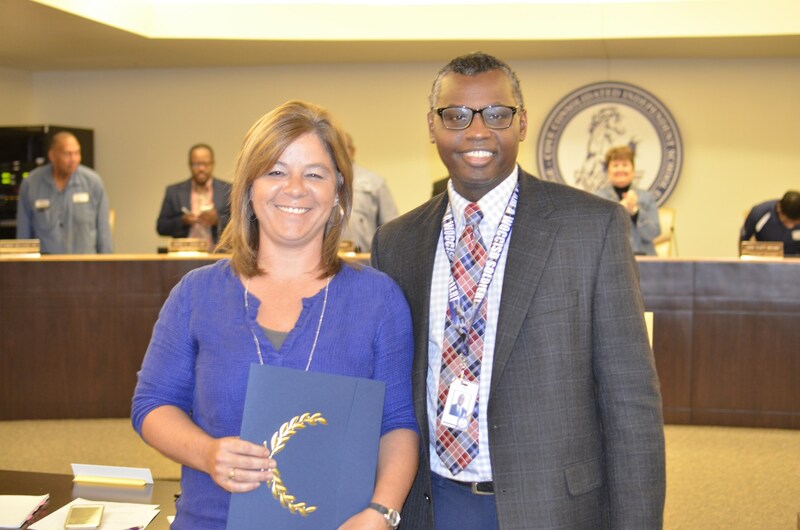 November 2017: West Orange - Stark Elementary secretary Tammy Brister is the District's November Employee of the Month. Congratulations! She supports the campus is so many ways, from arranging for substitutes, workshop registrations, travel, and more. She is always helpful, dependable, professional, and efficient. 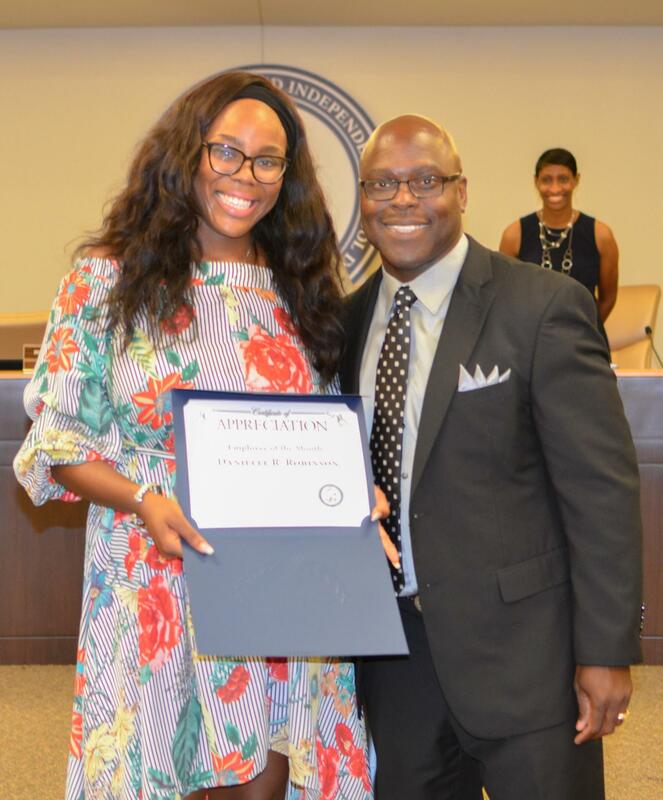 She is pictured with WOS Principal Dr. Troy Bethley. July 2017: Assistant Superintendent of Schools Dr. Nina LeBlanc supervises not only Human Resources, but also Curriculum and Instruction. At this time of the school year, she is VERY busy guiding, supervising, recruiting, and processing so many individuals, many of them brand new. At the same time, she is always available to help others –she will answer questions and provide suggestions. She has endured a personal tragedy, yet her commitment to making sure everything is running smoothly has been second-to-none! We value her greatly! She is pictured with Superintendent Rickie Harris.